A Captivating Tradition Returns! The Wayne Center Ballet will present the 15th biennial performance of the Nutcracker, the magical holiday tale of Clara and her marvelous journey with the Nutcracker Prince. The ballet premiered 28 years ago and features an outstanding cast of local students and professional guest artists. Treat yourself and your loved ones to the tradition of this timeless ballet filled with magic and wonder for the entire family. Performances will be at the Performing Arts Center at Wooster High School on Saturday, December 8 at 2:00 and 7:00 p.m. and on Sunday, December 9 at 2:00 p.m. Tickets are $20.00 each with $8 tickets available for children age 12 and under; adult tickets for Saturday’s matinee will be available at a reduced ticket price of $15.00. Tickets are on sale now online at www.wayneartscenter.org. 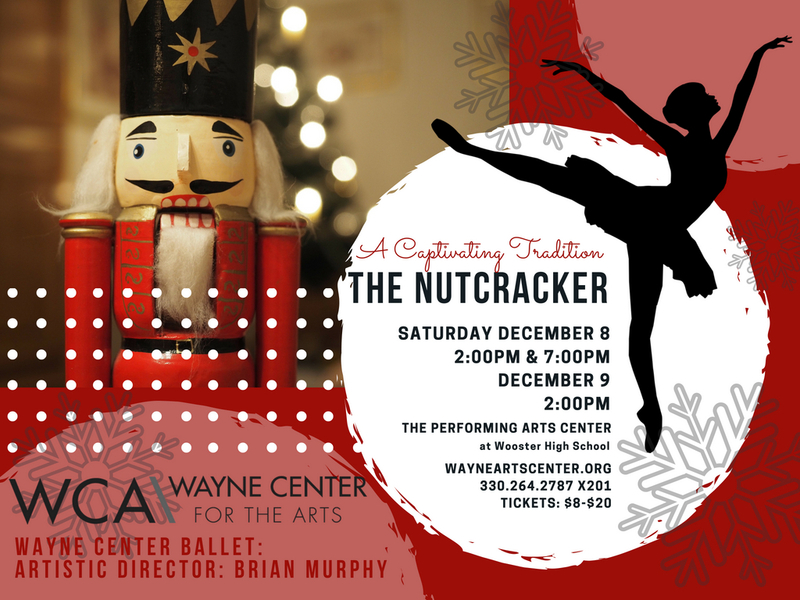 The Wayne Center for the Arts Nutcracker features Wayne Center Ballet Company dancers between the ages of 6-18, community members, and guest artists Ethan Michael Lee and Regina Pietraroia performing the Grand Pas de Deux. Ethan Michael Lee currently teaches at Dance Arts by Regina and Cleveland City Dance; he most recently performed professionally for Neos Dance Theatre, and has trained at the Canton Ballet, Pittsburgh Ballet Theatre, and Joffrey Ballet New York. Regina Pietraroia is the director of Dance Arts by Regina in North Royalton, Ohio, and has performed with Ohio Dance Theatre, City Ballet of Cleveland, North Pointe Ballet, Cleveland Dance Exchange, and many more. Ballet Excel Ohio will also be featured as special guests performing the Russian Dance of the Candy Canes. According to Brian Murphy, the Artistic Director of the Wayne Center Ballet, the featured guest artists are a highlight of this year’s production. "I am excited to welcome guest artists from the professional dance world to join us for The Nutcracker this year. I believe it is vital to the pre-professional dancers' education to be challenged and to perform alongside our professional guest artists. All the dancers are excelling in the rehearsal process and I look forward to sharing their enthusiasm and accomplishments with the public,” Murphy said. Kimberly Payne, Dance Coordinator, says she’s thrilled to see the Nutcracker production continue to develop under Murphy’s leadership. "Having followed Brian Murphy's dancing career rise since his performing with Ohio Ballet in 1997, I'm delighted to see how his experience, energy, and creativity have made his approach to directing our ballet company so vital to the ballet community in Wooster. His sensibility toward tradition and progress has been instrumental in taking Wayne Center Ballet into the future." Wayne Center Ballet dancers performing principal roles this year include: Franklin Elementary sixth-grader Hannah Arnold as Clara; tenth-grade homeschool student Alicia Martinez as the Sugar Plum Fairy; sophomore Wooster High School student Julian Grimes as the Nutcracker; sophomore Wooster High School student Oneli Basnagala, eighth-grade Green Middle School student Alayna Green, and homeschool student Brianna Shearer as Dew Drop Fairies; and eighth-grade Wooster High School student Duncan Grimes as the Mouse King. Wooster’s own community performers appearing are John Scavelli (Law Director, City of Wooster), Scott Schroer (Wayne Savings Bank), Michael and Melissa Seifried (MD, Cleveland Clinic), Armando Martinez, Jacquelyn Sweiger, and Tricia Pycraft (Attorney, Critchfield, Critchfield & Johnston).